How to see Rome in a day | Cooking Wine And Travel - The site where Foodies Unite! 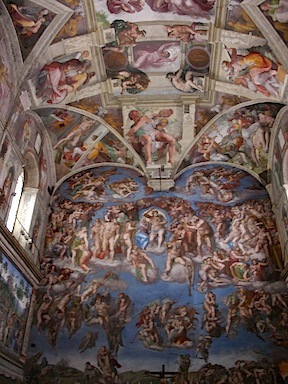 There are a lot of things to see and do in Rome, but the most important thing to see is the Vatican, and the best way to see the Vatican is with a privately guided tour. It is a bit expensive (about $300 EURO), but it is well worth the money. The concierge at most high-end hotels can help arrange a private tour, and if your hotel does not have a concierge with this connection, simply call any 4 or 5 star hotel in Rome, ask for the concierge and tell them you want a private tour. The concierges get paid on commission, so most of them will be more than happy to set you up with a private tour. If you want to see the important parts of Rome in one day, I would suggest you take a cab from your hotel to the Trevi Fountain and work your way across town. This is the order that I would suggest you walk (each of these are a short walk from each other). 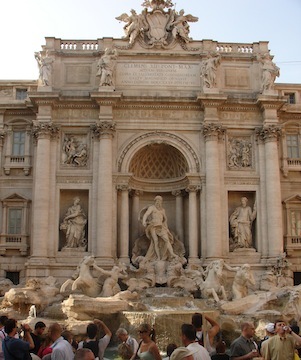 1) Trevi Fountain (Fontana di Trevi): Certainly the most famous and photographed fountain in Rome, legend has it that whoever throws a coin into the pond will return to Rome. From hear you will walk through one of the best shopping districts in Rome as you head to the Spanish Steps. 2) Spanish Steps: Both the steps and the Piazza di Spagna get their names from the Spanish Embassy to the Vatican on the piazza, opposite the American Express office, though the staircase was built with French funds in 1723. 3) Pantheon: Dedicated to the seven planetary divinities and featuring an interior of gorgeous marble, the Pantheon is one of the most impressive monuments of Augustan Rome. It is also the site of the first Catholic Church. 4) This would be a good time to stop for lunch. If you stand with your back to the Pantheon you will see a street/alley across the piazza to the left. Follow that one block to Piazza della Maddalena. There is a great restaurant in this Piazza called Clemente. 5) Piazza Navona: The most outstanding square of the Baroque period in Rome features Bernini´s Fountain of Rivers at its center as it faces Borromini´s church, Sant´ Agnese in Agone. The fountain in the center is also the central scene of òAngels and Deamonsó, the first book by the author of "The Divinci Code." From here it is a 15-minute walk to the next step, so you may want to walk out of the south end of Piazza Navona until you hit the major street. You should be able to catch a cab there to Palazzo Venezia. 6) Palazzo Venezia: This is one of the most dramatic structures in Rome and sits at the heart of all of the tourist sites. It is also where the movie Cleopatra starring Elizabeth Taylor was filmed. The building is actually the monument to their fallen soldiers similar to our Tomb of the Unknown Soldier. Although it looks historic, it is less than 100 years old. But this is why it is really important: You should hike up to the very top (take the stairs to he right) and keep following the signs to the "cafeteria". Once you get up there you will find a scenic overlook to the left rear of the building. There is also a little caf� up there where you can get a drink. From this vantage point you will be looking down over most of the Roman ruins to include the Colosseum and the Roman Forum. There are signs on the handrails that describe each monument below. 7) When you are ready to move on, go to the right rear of the overlook (opposite end from the cafe). If you look up you will see a very plain looking tall red brick structure. Take a moment to go inside. It is one of the most beautiful churches in Rome call Basilica di Santa Maria. 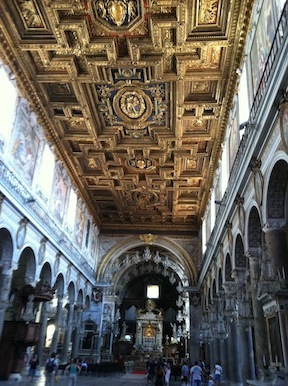 8) When you leave the Basilica di Santa Maria, walk strait down the stairs to the street below. Once you get to the street, turn left and make a U-turn and you will see the stairs leading up to Museo Centrale. When you arrive at the top of the stairs, head to the alley in the far right corner where you should find several interesting vistas looking down into the Roman Ruins. You can pay to walk through the ruins, but you can actually see them very well for free from this area. From here your are a 5-minute walk to the Colosseum. 9) Colosseum (Colosseo): Perhaps the best-preserved of the monuments of ancient Rome, this huge marble structure was built to hold more than 50,000 spectators who witnessed the slaughter of wild beasts and bloody contests of might by gladiators. Here is a great tip: when you arrive there will likely be huge lines of people waiting to get in. You will be harassed by tour operators who will offer you the chance to jump the line if you join their group. Waive them off and head past the lines to the line marked "group tours." If anyone asks you, tell them you are taking a self-guided audio tour. When you get to the front of the lines, you will see a station for self guided audio tours. You can rent the headphones for about $8 Euro and go right in. We didn´t even use the headphones, but we got into the place in about 5 minutes. We have been to many restaurants in Rome and Italy, but our favorite remains Santo Padres. It is located on Via Collina 18 and the phone number is 06-4745405. This is a small family style restaurant where you don´t need a menu. The prices are very low for Rome. There is also a very good restaurant called Vechio Roma. It is in Piazza Campitelli.